Fermentation is caused by minuscule organisms called yeast, which get the party started. They are the bartenders, eating up the sugar and giving us alcohol. I don’t know if it is appropriate, but one might say that the alcohol was created by a “yeast infection”. The doctor says it is caused by dampness. The first wine was the result of grape juice left in a clay pot, and at a warm temperature, the yeast had a feast. They left behind humanity’s saving grace…alcohol. Fermentation is the conversion of sugar into alcohol. Grapes are made of fructose, glucose and sucrose; when these sugar feigning organisms get started, they convert the sugars into ethanol. Wa-la, we have wine. Fermentation can also take place cooped up in a bottle, such as in Champagne. Liqueur de triage is added and carbon dioxide is produced. Magically, we have bubbles. What about Carbonic Maceration? Fermentation takes place in the grape and then it is pressed. The enzymes convert the flesh into ethanol and we get bubble gum flavors. And since we are talking about fermentation, we can’t forget Malo-lactic fermentation. Rombauer made millions from this! This another secondary fermentation in which malic acids (tart and austere) are turned into lactic acids (soft and creamy). Yes most reds go through this 2nd fermentation, it just makes them more approachable. When it occurs with whites, it another story. It becomes a winemakers choice. 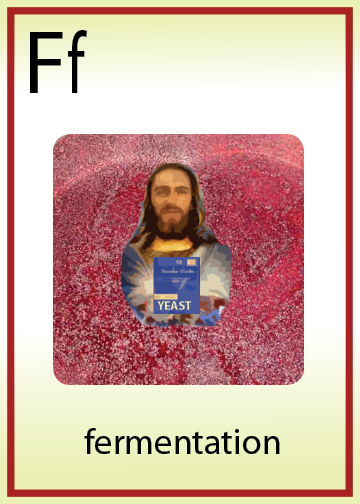 One might say that Jesus was a master at fermentation, he turned water into wine. Actually, Jesus was not a master of fermentation. His first faith-based initiative was at the wedding feast in Cana, where with no time nor (given his powers) need for fermentation, he turned water into wine instantly, just like THAT, proving that great wine is not ALWAYS made in the vineyard. “Keep calm and party on,” he said afterward in Aramaic, or possibly Hebrew (but, most scholars agree, not Yiddish). Fermentation–messy, time-consuming, occasionally unreliable–is the task of mere mortals. Although we don’t know for certain what wine he made, the dictum ‘A wine’s first duty is to be red’ dates to his era, and we may be sure that it was not a meritage wine but a single-well terroir wine, made from local water. I knew if I put Jesus’s name into this post I would get a response. Thanks for the comment and great info. Party On!